(CNN) -- Sarah Palin did not visit troops in Iraq, a spokesperson for the Republican vice presidential nominee confirmed Saturday, as new details emerged about the extent of the Alaska governor's foreign travel. Gov. Sarah Palin's aide confirmed to CNN details of her foreign travel Saturday. In July of last year, Palin left North America for the first time to visit Alaskan troops stationed in Kuwait. Palin officials originally said her itinerary included U.S. military installations or outposts in Germany and Kuwait, and that she had visited Ireland. A Palin aide in Alaska had said Iraq was also one of the military stops on that trip. The Boston Globe, however, reported Saturday that in response to questions about the trip, Alaska National Guard officials and campaign aides said Palin did not go past the Kuwait-Iraq border. In addition, campaign aides also confirmed reports to CNN Saturday that Palin's time in Ireland on that trip had actually been a refueling stop. The Obama campaign -- which has increasingly accused the McCain campaign of deliberately lying in ads and on the stump -- was quick to highlight that story, along with a news report that explored whether the McCain campaign has been sending out wildly inflated crowd estimates. The McCain team has twice pointed to law enforcement as the source for those estimates -- but the same officials denied to Bloomberg News that they had provided the numbers cited by the Republican nominee's campaign. "The McCain campaign said Gov. 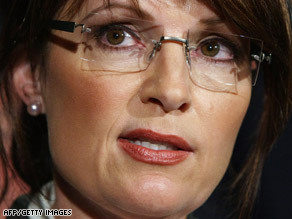 Palin opposed the bridge to nowhere, but now we know she supported it," said Obama spokesman Tommy Vietor in a statement. "They said she didn't seek earmarks, but now we know she hired a lobbyist to get millions in pork for her town and her state. They said she visited Iraq, but today we learned that she only stopped at the border. Americans are starting to wonder, is there anything the McCain campaign isn't lying about?" A Palin spokesperson also confirmed that the governor had visited Mexico on a personal vacation. She has also visited Canada. The Palin revelations Saturday are the latest in a series of barbs between the two presidential campaigns. McCain, appearing Friday on ABC's "The View," was aggressively pressed on Palin's qualifications to be vice president as well as his new campaign ads that several independent fact-check groups have called misleading. Co-host Barbara Walters asked about Palin's reformist credentials, noting McCain has served in Washington for more than two decades and asking repeatedly, "Who's she going to reform, you?" McCain answered by saying Democrats have controlled Congress for two years, but then Walters quickly interrupted: "But tell me who she is going to reform -- we aren't talking about the economy, we're not talking about housing; she was chosen to reform, who is she going to reform?" Appearing somewhat frustrated, McCain said, "The Democrat Party, the Republican Party, even an independent. She'll reform all of Washington." Walters, seeming somewhat exasperated, asked, "How? What will she do? What is she going to reform specifically, senator?" "The fact is she was a reform governor, she took on an incumbent governor of her own party and defeated him. She sold the airplane and fired the chef," McCain said, referring to Palin's efforts to put her predecessor's state jet up for auction on eBay and her dismissal of the governor's personal chef. "She sold the airplane at a loss," Walters interrupted. Also on Friday, both campaigns accused each other of engaging in lies, unfair attacks and gutter politics in a series of television ads and memos. McCain's campaign released a television ad, titled "Disrespectful," that accuses McCain's Democratic rival of launching desperate attacks and smears against Palin. In the McCain ad, the announcer says the Obama camp had "lashed out at Sarah Palin" and dismissed Palin as "good-looking" as the Democratic nominee's face appears on the screen. The announcer also says the Democrats had said Palin was doing "what she was told" and had "desperately" called her a liar. "How disrespectful," the announcer says. "And how Gov. Sarah Palin proves them wrong, every day." Biden repeatedly has said on the campaign trail that he respected Palin and that he thought she was qualified for the vice presidency. FactCheck.org pointed out the quote from an Obama adviser that Palin was doing "what she was told" was taken out of context. The quote is taken from the response of Obama's chief strategist, David Axelrod, in which he said Palin had misrepresented Obama's legislative record. "Maybe that's what she was told" about his voting record, Axelrod said. In the second Obama ad, the candidate himself appears. "We've heard a lot of talk about change this year. The question is, change to what?" Obama asks. The ads come as Obama's campaign manager, David Plouffe, issued a tough memo to reporters that accused McCain and his campaign of turning to "smears, lies and cynical attempts to distract from the issues." CNN's Peter Hamby, Ed Hornick and Rebecca Sinderbrand contributed to this report.